The interior of the 2018 Equinox is surprisingly expansive, offering comfortable seating for five adults and as much as 63.5 cubic feet of available cargo space thanks to the split folding second-row seats. The dual-cockpit design places commonly used features within easy reach of the driver and front passenger so fighting to reach the controls is no longer necessary. A handy floor console and integrated armrest similarly ensure that everyone up front can relax and settle in for the long haul. Heated Rear Seats: Selected trims offer outboard passengers a warm, cozy place to spend the daily drive. Teen Driver: Advanced technology monitors driving habits, safety belt usage, and more and can provide reports to help young drivers improve. Rear Seat Reminder: When the rear doors are opened the vehicle remembers and alerts drivers to check for forgotten passengers. MyLink: The Chevrolet MyLink infotainment system with 7- or 8-inch color touchscreen and Apple CarPlay or Android Auto allows drivers to connect a compatible smartphone and access hands-free calling, music streaming, apps and more. Hidden Storage: The hidden rear cargo well makes it easy to stow valuables when out and about or just put away pesky gear. Ventilated Seats: The available heated and ventilated front seats make even the longest trips bearable in any weather. Premium Audio: Audiophiles can enjoy an optional Bose premium audio system with access to satellite radio on selected trims. Panoramic Sunroof: An optional panoramic power sunroof lets the sunshine in on even the gloomiest winter days. Getting all of this and more is easy, when you choose to finance your Equinox with Patsy Lou Chevrolet. 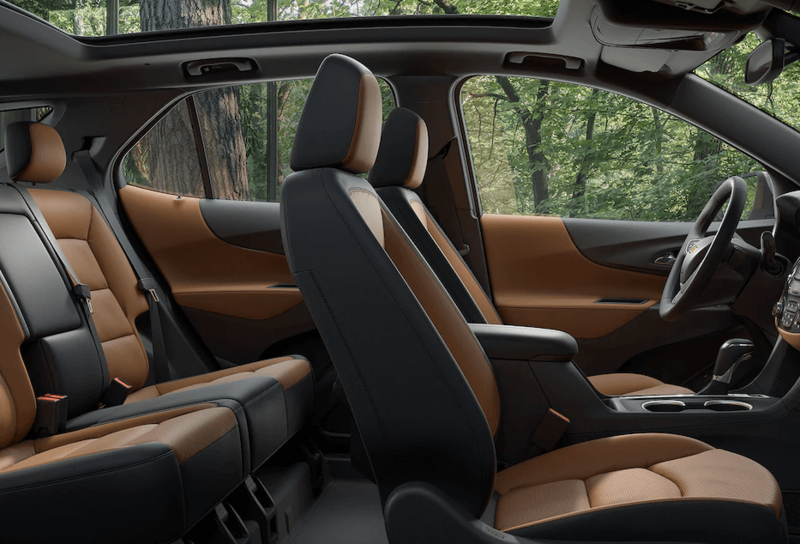 Explore the comfortable 2018 Chevy Equinox interior on a Flint or Clio test drive. Contact Patsy Lou Chevrolet at (810) 600-3330 or stop by our showroom at 5135 Corunna Road in Flint, MI to get started.